Microsoft announced earlier this week that it will be buying solar power from the Sunseap Group in Singapore. The deal will be their first for renewable energy in Asia. In recent years, Microsoft has been moving towards investing in renewable energy and integrating it into their systems. In 2016, Microsoft laid out their plans to transition to clean power. Microsoft aims to have 60% of the total power needed to power their datacentres and operations coming from renewable energy by the next decade. 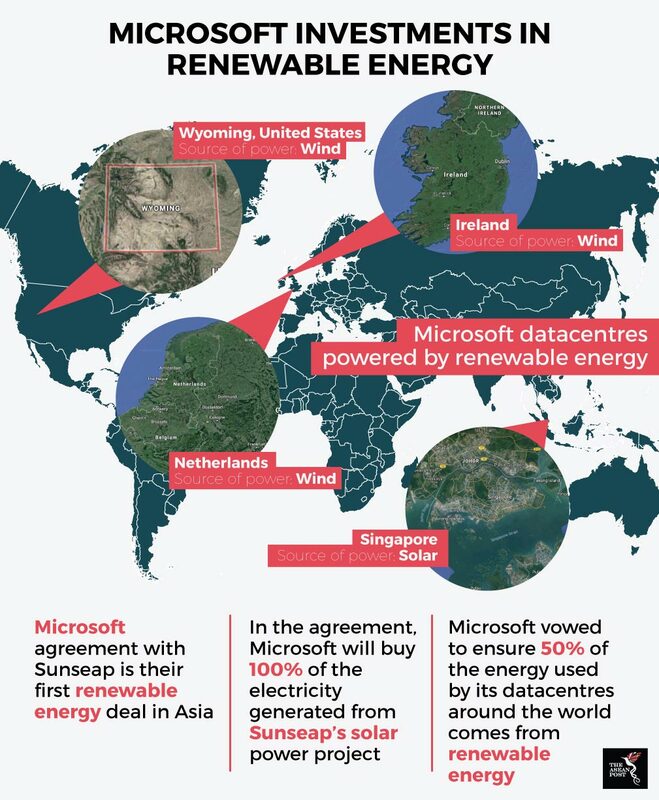 Previously, Microsoft had made investments in renewable energy in other parts of the world. A notable one is an investment they made in Wyoming, United States. The purchase of 237 megawatts of wind energy is one of their biggest investments yet. The energy purchased will be used entirely to power their datacentre in Cheyenne, Wyoming. Aside from that, Microsoft has also made investments in wind energy in the Netherlands and Ireland too. Similar to the situation in Wyoming, these investments are being made to power the company’s datacentres there. Microsoft’s purchase of solar power from Sunseap Group shows their commitment in meeting their goal of utilising more renewable energy in their operations. While the value of their purchase was undisclosed, the agreement has been described by them as “…the single-largest solar energy portfolio in Singapore to date.” According to the 20-year agreement with Sunseap, Singapore’s leading solar energy provider, Microsoft will purchase 100% of the renewable energy that the solar project exports to the grid. This deal doesn’t only help Microsoft become more environmentally friendly, but also boosts the growth of the local clean energy economy. The deal follows from a renewed commitment by Singapore to tackle climate change. Earlier this month, Singapore announced in their 2018 Budget that a carbon tax will be implemented in 2019. Singapore is the world’s 26th largest carbon emitter per capita and is looking to reduce their carbon emissions. Investments like this from Microsoft will no doubt be welcomed. Solar power in Singapore has increased in recent years from 33.1 megawatts peak in 2014 to 129.8-megawatt peak in the first quarter of 2017 according to Singapore’s Energy Market Authority (EMA). In October 2017, the country set aside SG$6.2 million to develop solar energy forecasting capabilities that would improve the accuracy for solar energy. Furthermore, in 2017, deputy prime minister, Teo Chee Hean said that the government plans to raise Singapore’s solar power capacity from 140-megawatt peak to 350-megawatt peak by 2020. The investments made by Microsoft show that commitments by Singapore to increase the use of clean energy in their energy mix is paying off. This could be a lesson for other Southeast Asian countries. As energy demand in Southeast Asia is forecasted to increase exponentially in the coming years, many countries in the region are looking to coal to power such demands. According to the International Energy Agency, coal alone will account for almost 40% of the total growth in energy demand for the region. While coal’s adverse effects on the environment is well documented, the preference for coal is down to its affordability. Another reason why some governments are hesitant to invest in renewable energy is because of concerns that it might not be profitable. Eco-Business reported in November 2017 that 45% of the total number of renewable energy projects in the region are not bankable. However, Singapore has been an exception. The island state has shown that taking a risk in renewable energy can pay off – especially now when many Western companies are looking to ensure their businesses are running on clean energy. Gone are the days when multi-national corporations notoriously turned a blind eye towards the environment. In recent years, large conglomerates such as Google, Apple, and Microsoft have made commitments to clean energy. While some skeptics might label such behavior as public relations opportunism, still, the large investments these companies make can help boost a nation’s economy. So, if other ASEAN countries are looking to attract investments from such conglomerates, they need to develop their renewable energy roadmaps. Even if the costs seem prohibitive now, but just like Singapore, the sacrifice might pay off in the long-run. The pay-off isn’t so much financial but the effort could lead to a much cleaner world for everyone to enjoy.